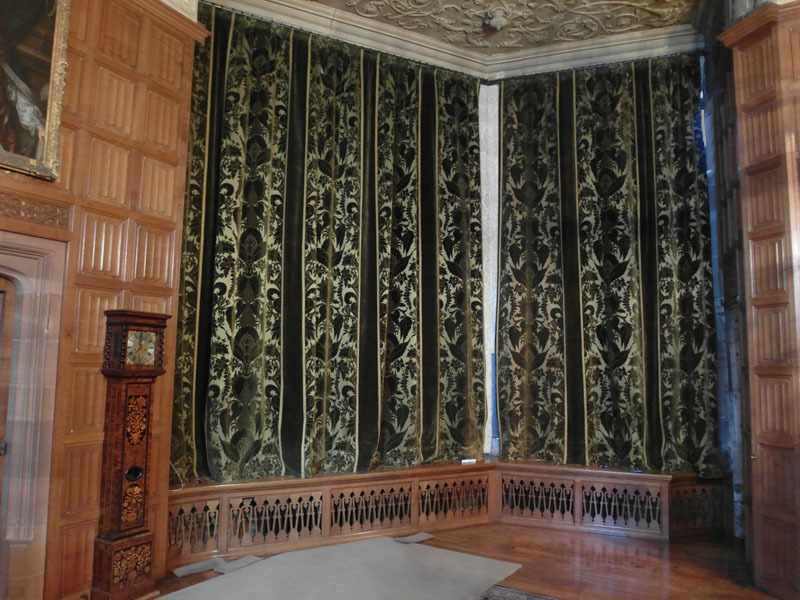 The Curtains from the Oak Drawing Room at Powis Castle were created by G.F. Bodley between 1902 and 1904, as part of the refurbishment of the room commissioned by the Earl of Powis. 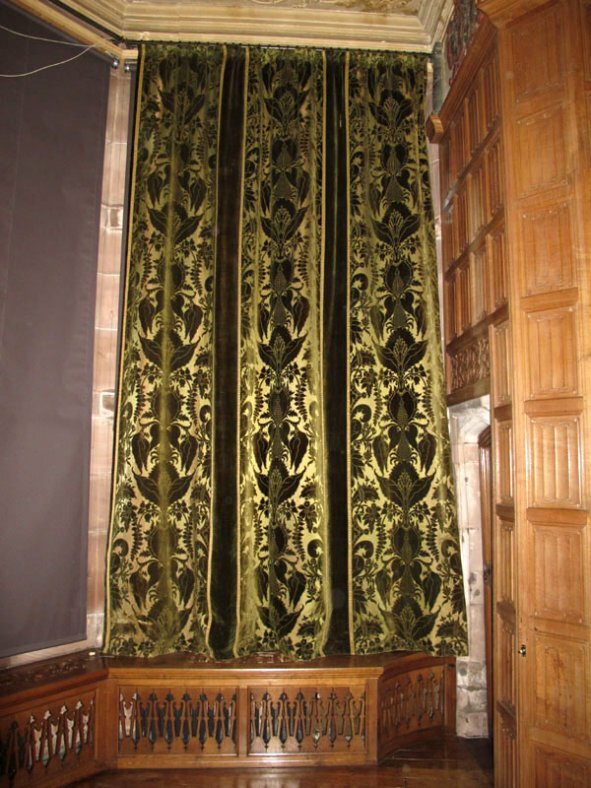 The curtains, of heavy green patterned silk velvet, are a prominent feature of the room and match the upholstery of the suite of furniture in the room. 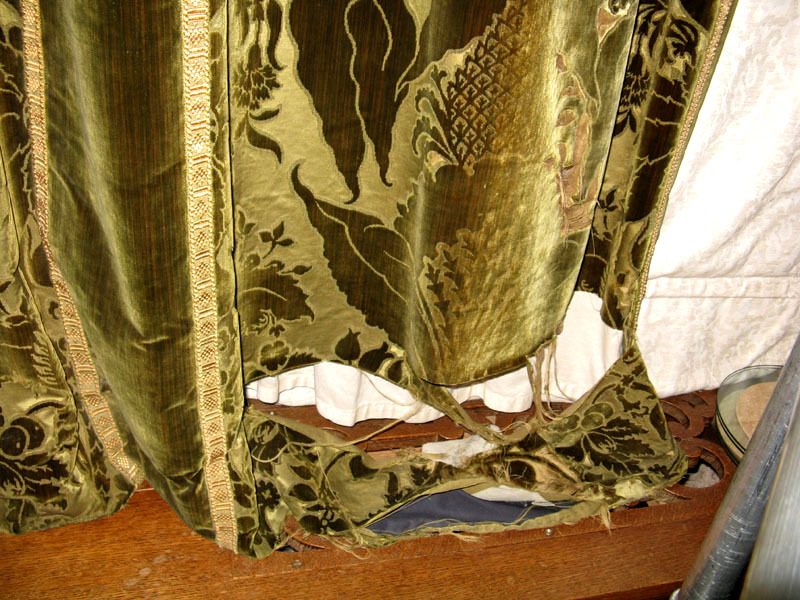 he curtains were extensively damaged by light which had caused fading and splitting, especially in the lower sections. 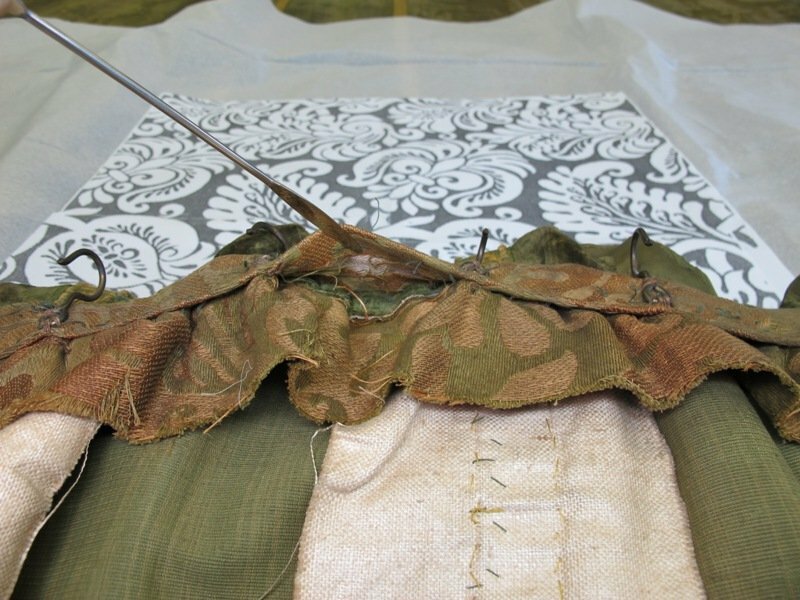 The original lining had presumably been destroyed by light damage as it had been replaced in the 1980’s with cotton sateen lining fabric. 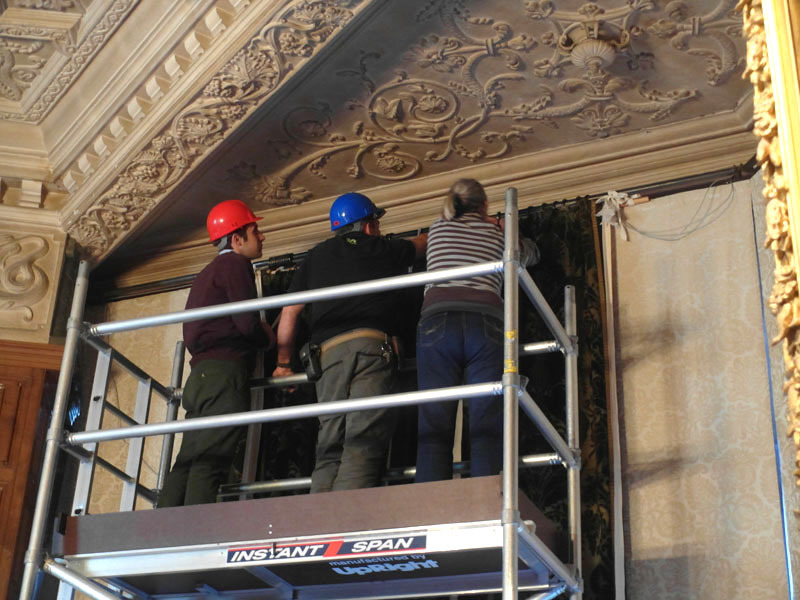 The curtains were also dusty and had water stains in the lower sections caused by water ingress through the windows. 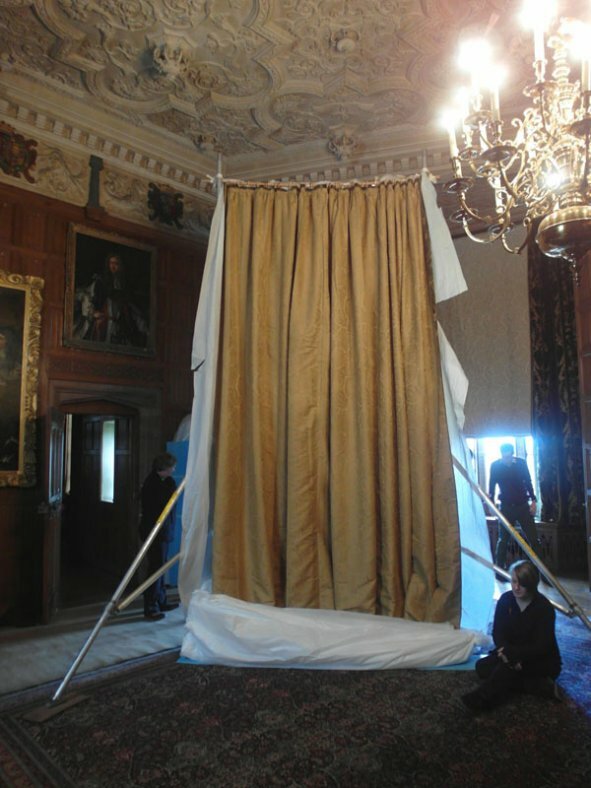 The curtains were carefully surface cleaned with a museum vacuum and distorting previous repairs were removed. 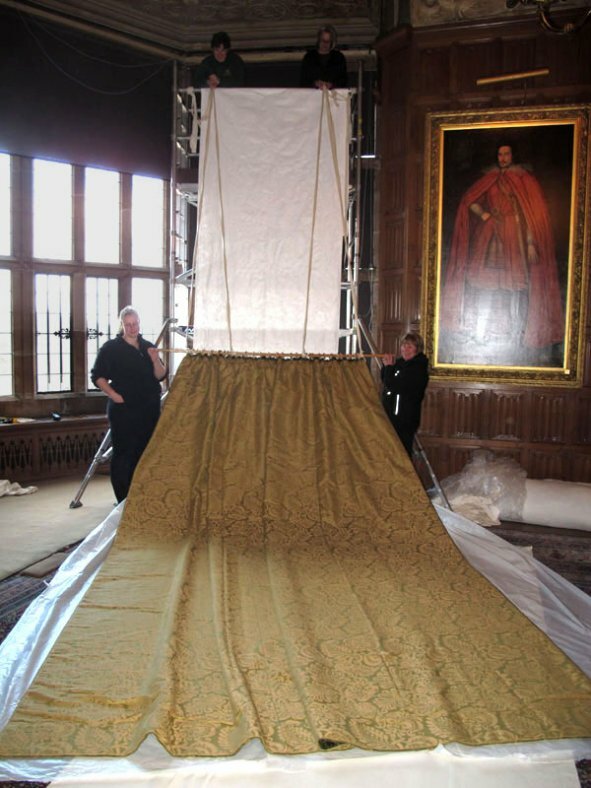 The curtains were supported on a firm, cotton fabric, dyed to match; the damaged areas were secured onto this with regularly spaced laid couched stitching lines. 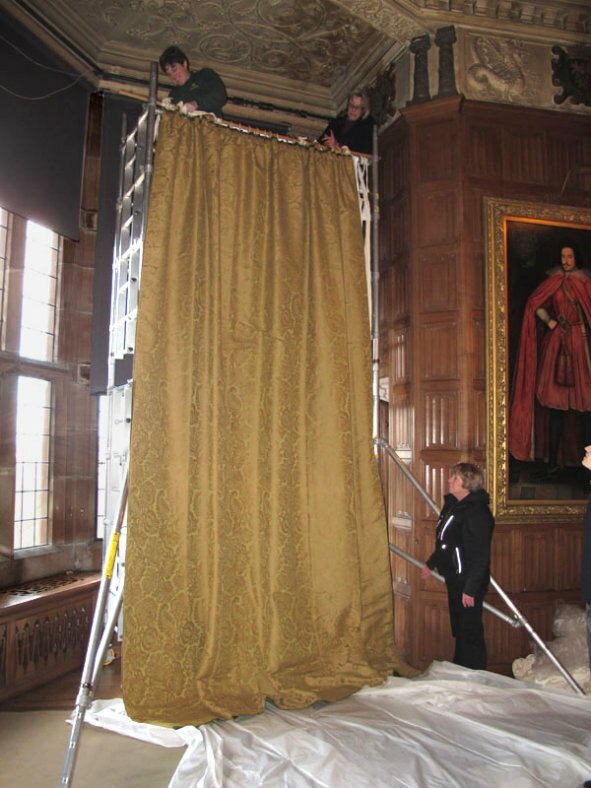 The weak areas of the curtains were covered with conservation net, dyed to match. 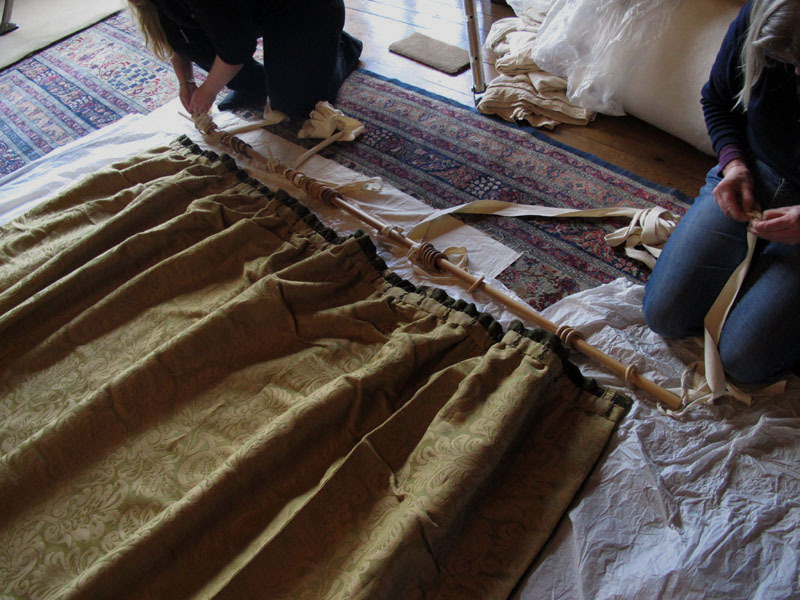 A most interesting discovery was made inside the heading of the curtain where we found a narrow strip of the original lining: a bold and colourful fabric, woven of hemp and cotton. 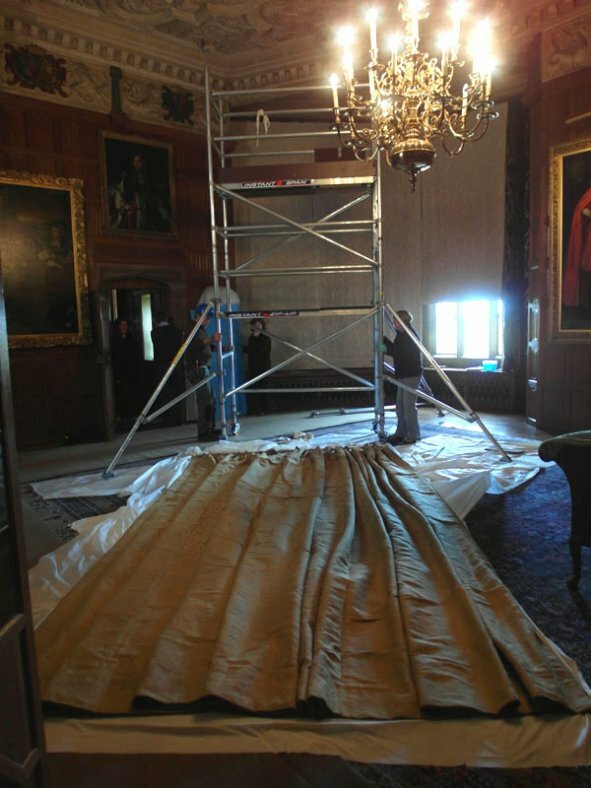 The pattern was recognised as a design copied from the Queen’s Antechamber Wallhangings at Ham House in the 1890’s by Bodley & Garner for the restoration of those hangings. 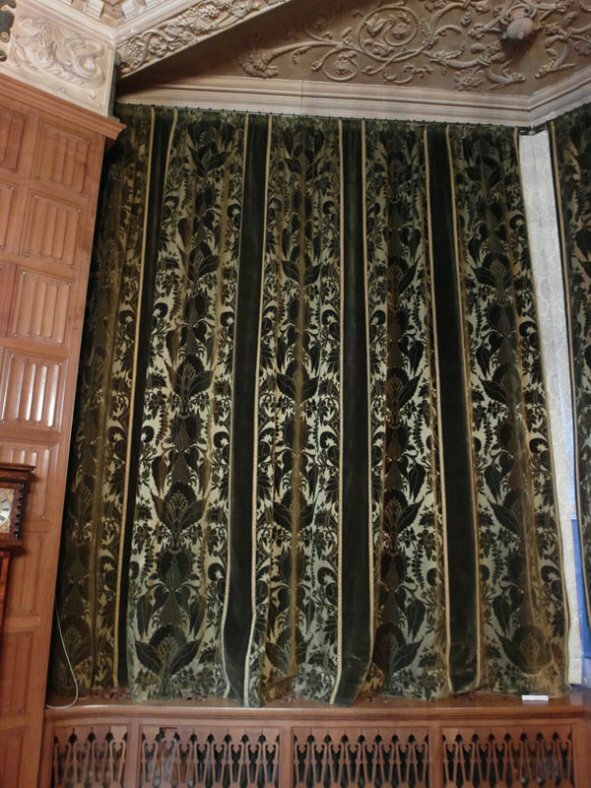 When their company Watts & Co put this design into general production they called it ‘Dysart’, after the family name of Ham House. 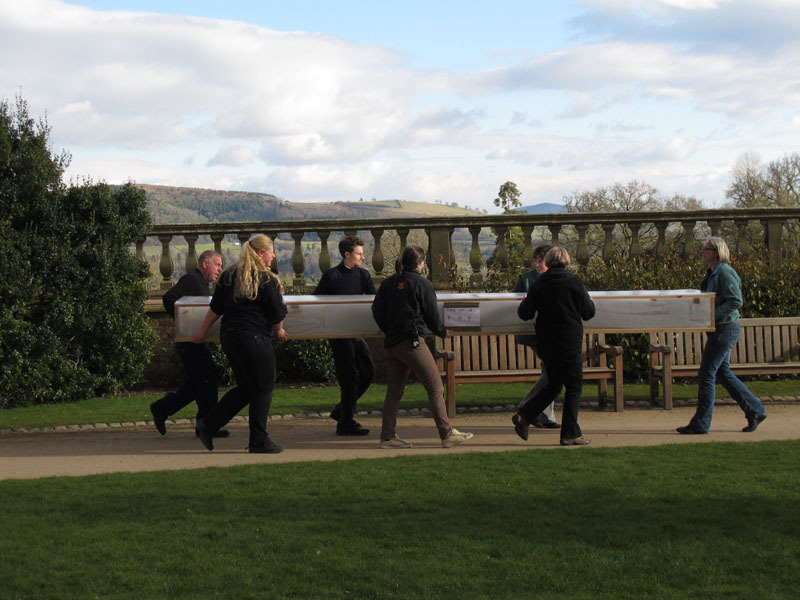 May and Gerda had carried out a great deal of research on that project, which enabled them to instantly recognise the pattern, information on this can be found here. 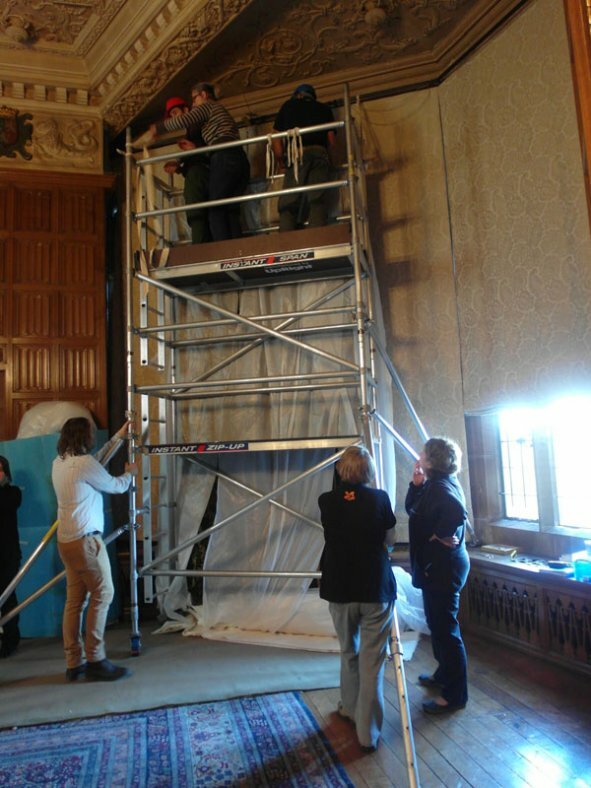 Another version was noticed during a conservation project at St Peter’s Church, Deene, in Northamptonshire. 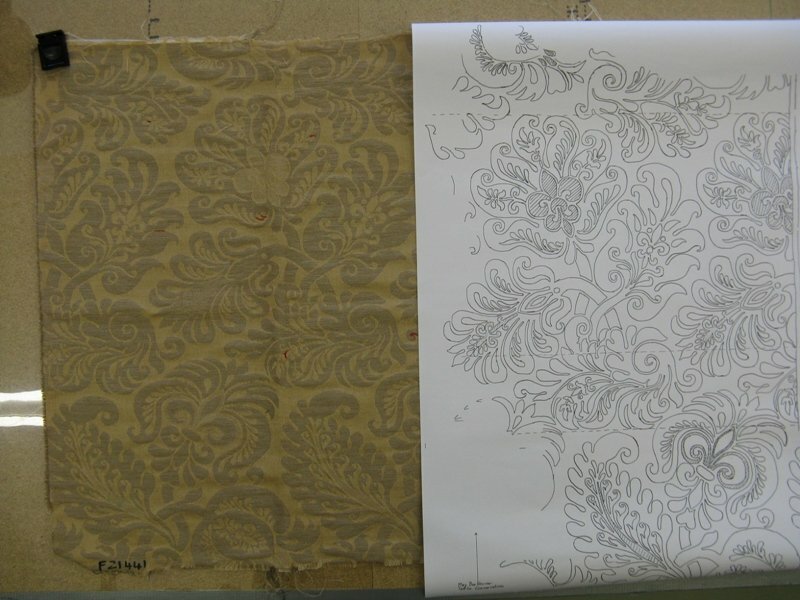 With permission from the Churches Conservation Trust who care for this church, that fabric was used to trace missing areas of the design and a pattern was produced for reproduction. 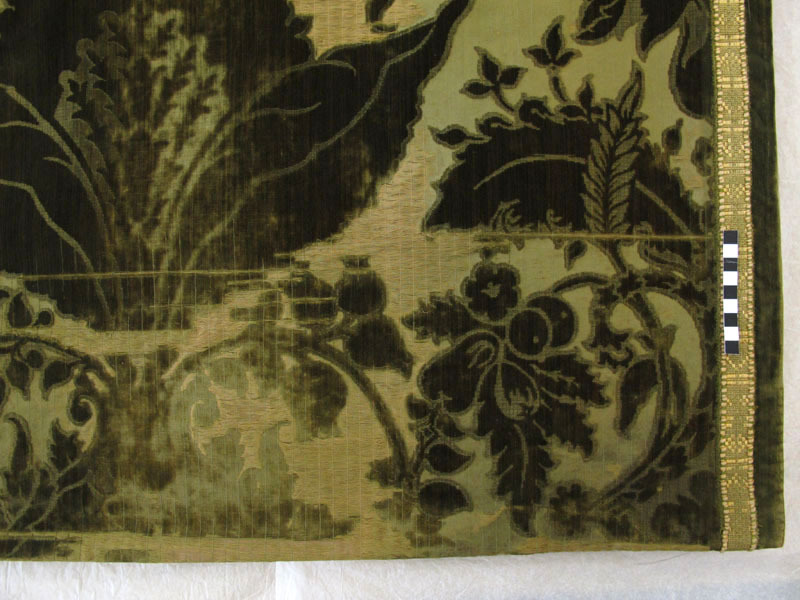 Humphries Weaving Company Ltd in Sudbury, Suffolk was commissioned to create a reproduction fabric from this pattern which was used as a new lining for the curtains, see the Humphries Weaving Company Ltd website. 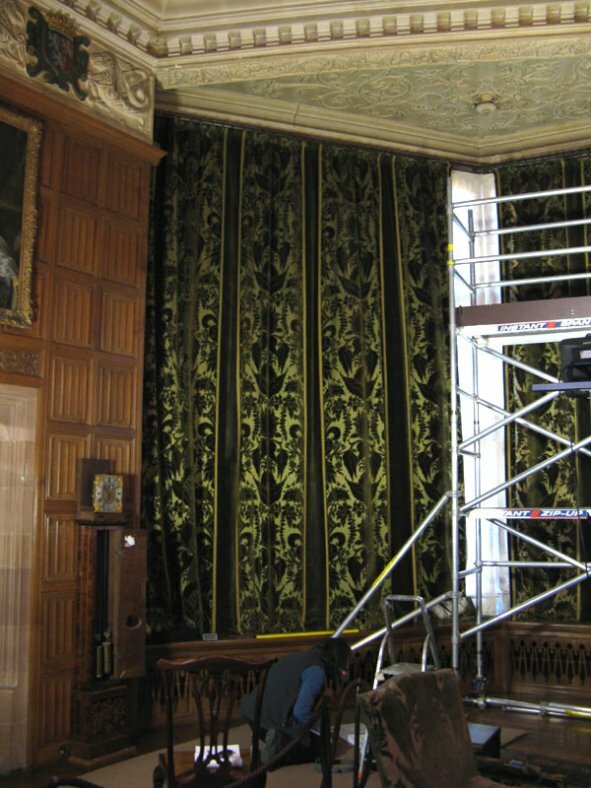 The new reproduction fabric is a wonderful show of a bold and colourful design, in keeping with Bodley’s style. 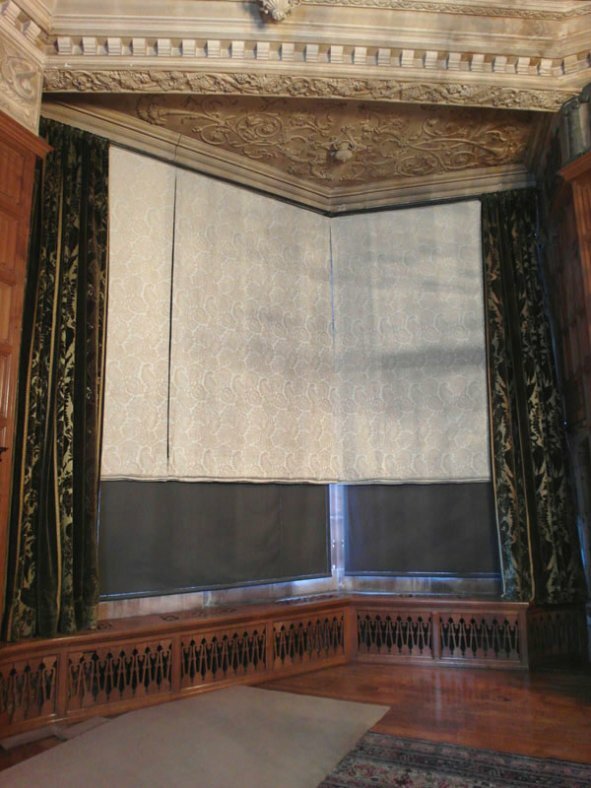 The curtains are now back at Powis Castle, cleaner, well supported and with proper protection from light by means of dark blinds combined with a white patterned Roman blind, also in the Dysart pattern. 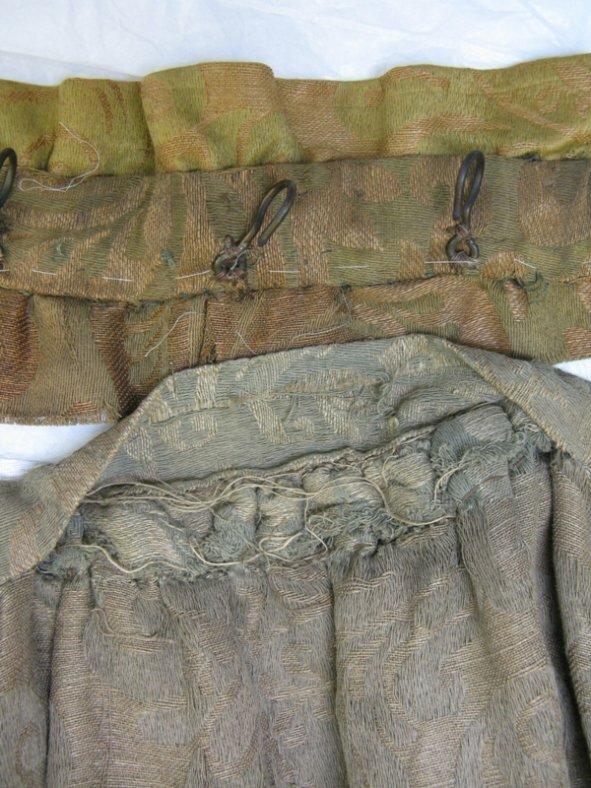 It was most interesting to undertake the research leading to the splendid result of conserving the existing fabric as well as recreating the appearance with the reproduction lining.